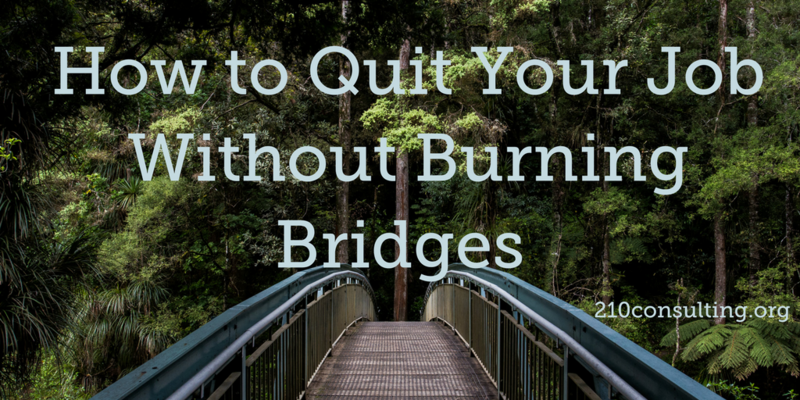 So you’ve decided you’re at the end of the road at your present job and are ready to say good-bye – but how to quit that job without burning bridges? We’ve all been there at one time or another. Best case you’re quitting because of a happy event in your life – you’re graduating from college and shifting into a career that uses your degree, or having a baby and staying home for a season, or perhaps you’re getting married and moving to a new city. Worst case is you just can’t take it any more – you hate the work, the way the company is run, or, chances are, your manager. In fact, according to a Gallup study, 50% of people quit their jobs due to a bad manager. So how to handle that? While it may be tempting to tell your boss what you think of his/her management style as you quit, keep in mind that how you go about turning in your resignation will directly affect the reference she will give you, whether formally or just through word of mouth. How you leave will color his/her perspective of your whole tenure there. First and foremost, wait until you’re not upset – never quit on the spur of the moment. That’s a sure way to say something you’ll regret. Much wiser to prepare and plan for your resignation. The objective is to be truthful, but kind and positive. You’ll want to prepare a resignation letter as well as what you’re going to say when you talk to your manager. Click here for some resignation letter samples. Spend some time thinking about all the positive aspects, all the nice things your manager has done in the past, all the positive qualities you can, your fondest memories of your time there, before you consider walking into his office. It can also be really helpful to try to imagine what might be going on in your manager’s life that might influence his/her behavior – perhaps his marriage is on the rocks, her child is being bullied at school, a close family member is sick, his direct supervisor is being difficult. Most of the time when people are behaving badly, they’re hurting or under great stress. If you can get in a place where you feel some compassion for your manager and more thankful for the positive aspects of the job or any good times in the past, you will be much more likely to pull off giving your resignation without causing hard feelings. 1) Start by thanking her for the opportunity to work for the company. Say a couple of the positive things you thought about as you were preparing. 2) Share that you’ve decided you need to leave the company for your most neutral reason as briefly as possible. Typically there are many factors that go into why someone decides to resign, so pick the most benign of your reasons to share, and don’t elaborate. Definitely don’t share that it’s because of his behavior. 3) Give two weeks notice – that is widely regarded as professional behavior. Communicate that you don’t want to leave her in the lurch – that you will update your colleagues on any ongoing projects and express your willingness to help train a new person. 4) Answer any questions he has as positively, but briefly, as possible. The less said, the better. 5) Close by thanking her again for the opportunity to work there, perhaps share another positive thing you appreciate about the company or a fond memory. Then leave his office as graciously and quickly as possible before things can turn sour.